For good food, clean and comfortable accommodation and a central location, there cant be a better option than this reasonably priced 3-star property. From feasting on sumptuous food at the affordable Black Jack Restaurant to later burning calories at the hi-tech gym or in the pool, this hotel lives up to its expectations. P Plus Hotel Pattaya is a 3-star hotel located in the heart of Pattaya in Thailand. The property is within walking distance of Central Festival Pattaya Beach. Ideal for leisure travelers and couples, P Plus Hotel Pattaya is equipped with an outdoor swimming pool, sports club, fitness center, and a sauna and steaming room for the guests at the hotel to unwind. One can enjoy all the modern amenities at the hotel at reasonable rates. 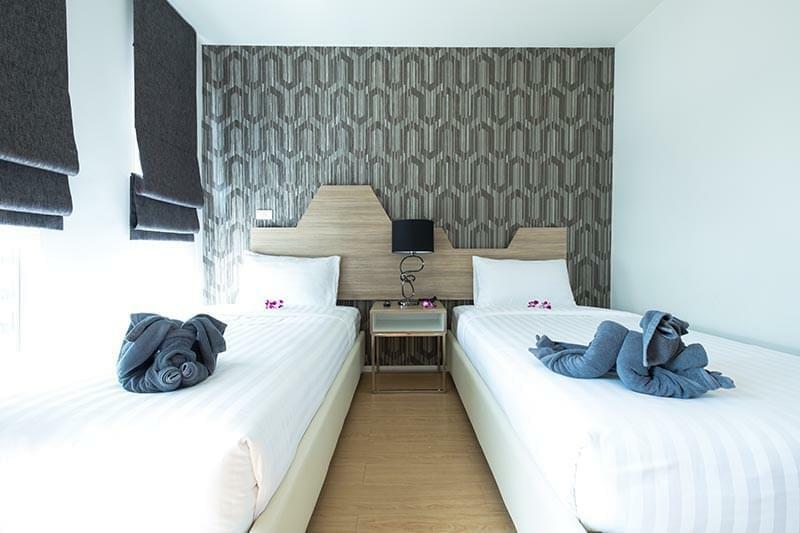 P Plus Hotel Pattaya features rooms with stylish cozy and trendy design. Accommodations at the hotel are designed to suit each and every kind of traveler. With one Backjack Caf, guests at the hotel can gratify their taste buds with several cuisines especially American cuisine. While the property is situated 2-hour drive from Bangkok, the famous Walking Street Pattaya for night entertainment is about 2 km away. The 3-star hotel with friendly staff has elegant, organized and beautifully decorated rooms. It offers rooms under two categories including studio double and studio twin. Studio double rooms are window facing to the swimming pool and town view. Studio twin rooms have large beds with all the modern amenities like mini fridge, electronic safe, double bed and air conditioner. Further, rooms at the hotel also feature a flat-screen TV with cable channels, a kettle, a shower, free toiletries, and a desk. 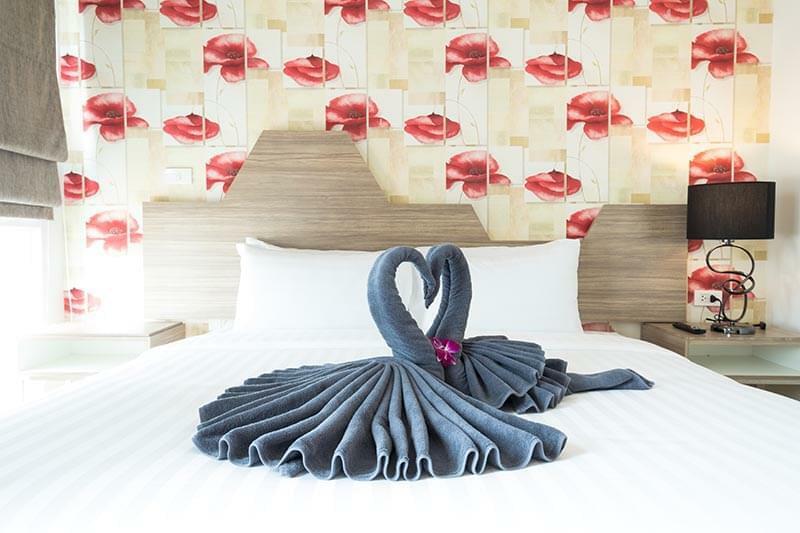 Each room under both the categories at P Plus Hotel Pattaya includes air conditioning and a wardrobe. One can make the most of their vacations by booking rooms with pool view. Apart from providing the luxury to soak in the creativity of nature, P Plus Hotel Pattaya provides a host of services that invite guests to experience bliss in their own way. With a well-equipped fitness center, outdoor swimming pool, sports club, fitness center, and a sauna and steaming room the resort aims to transport its guests to a zone of utmost relaxation. P Plus Hotel Pattaya Thailand prides on its open-air dining areas and pool level tables that offer great views of the outside world with the flavor of local cuisines. Guests can avail high-speed Internet connection. Moreover, the hotel offers parking, laundry and housekeeping services. It also features a variety of services like a 24-hour front desk and tour desk. Notably, internet access is available in all areas and is complimentary. The resort maintains an in-house restaurant, namely Blackjack Caf. Located on the ground floor of the hotel, the restaurant is quite popular among tourists as one of the finest dining options to taste some of the mouth-watering local dishes. The restaurant also serves the Western dish and other international favorites in air-conditioned comfort. Some of the tables at the dining option are placed at pool levels to offer great views of the outside while gorging on some of the great dishes made by the chefs at the restaurant. Buffet and la carte options are also available at the restaurant. Staffs at P Plus Hotel Pattaya Thailand work continuously to make its guests feel comfortable during their visit with the best of amenities and natural landscape. Enjoy the local scene at Central Festival Pattaya Beach and the craziness of Pattaya. The city is also known for its bustling nightlife. At P Plus Hotel Pattaya, one is sure to enjoy his time at its fullest with state-of-the-art amenities at the resort. What is the approximate time taken to reach the international airport from the hotel? P Plus Hotel Pattaya is located at a distance of 41 km from the U-Tapao Rayong-Pattaya International Airport. Is complimentary breakfast available at the P Plus Hotel? Yes, the room tariff is inclusive of the breakfast for all guests at P Plus Hotel Pattaya. Is kid-friendly buffet provided at P Plus Hotel Pattaya? Yes, the property offers a kid-friendly buffet for children at the resort. Are there any entertaining activities to do while lodging at this hotel? At P Plus Hotel Pattaya, guests can indulge in beach activities during their stay at the hotel. One can do swimming, water sports and can have food and drinks at the hotel. Guests can also relax sitting on the white sand watching the sunset. Is complimentary parking available at P Plus Hotel Pattaya? Yes, complimentary parking is available at P Plus Hotel Pattaya. Set against the glittering Andaman Sea, P Plus Hotel Pattaya is a great place for beach lovers. Guests can feel raw nature and its beauty at the hotel. The hotel boasts of warm hospitality with friendly staff. From sauna and steam rooms to rooms with pool views, the hotel anticipates every requirement of its guests. Featuring a perfect accommodation, mouth-watering dishes, and selected drinks, the hotel has everything that a traveler desires. Stroll around the city and know the local culture of the country. Guests have endless ways to unwind here at the hotel and sunset view from the beach at the end of the day is pure bliss. Guests at the hotel can rest assured of a more than comfortable stay accompanied with great facilities to keep them entertained as well as relaxed. Proximity to the beach is just a cherry on top as guests can walk up to the beach at any time during the day and have a fun-filled beach holiday.